Jean has been with Aultman College since 2007 and currently serves as President of the college. She chose to work at Aultman College because of its teaching focus, small class sizes, and opportunities it provides for professional growth. 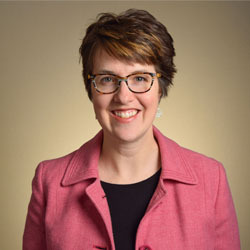 In her role as president, Jean hopes to inspire learning and challenges students, faculty, and staff to think differently about academics as well as their day-to-day roles. She previously served as Aultman College’s Vice President of Academic Affairs and occasionally still serves as an adjunct faculty for chemistry. Jean lives in Bolivar, Ohio with her husband Thomas and their (quasi-obedient) rescue dog named Linus. In her free time, Jean serves as an Ohio Certified Volunteer Naturalist, travels, reads, and seeks out nerdy events in Northeast Ohio.